How much should be read into the disappearance of a single stained glass window? 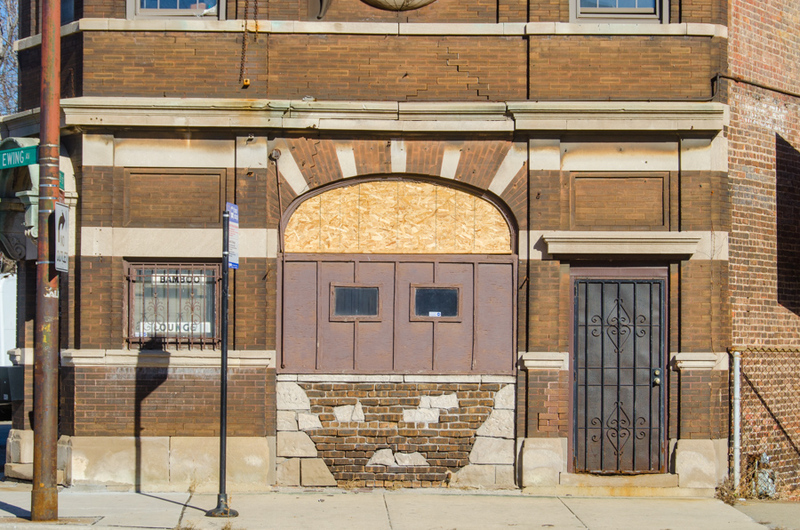 For the forlorn Bamboo Lounge at 9401 S. Ewing, could it be a warning of worse to come? 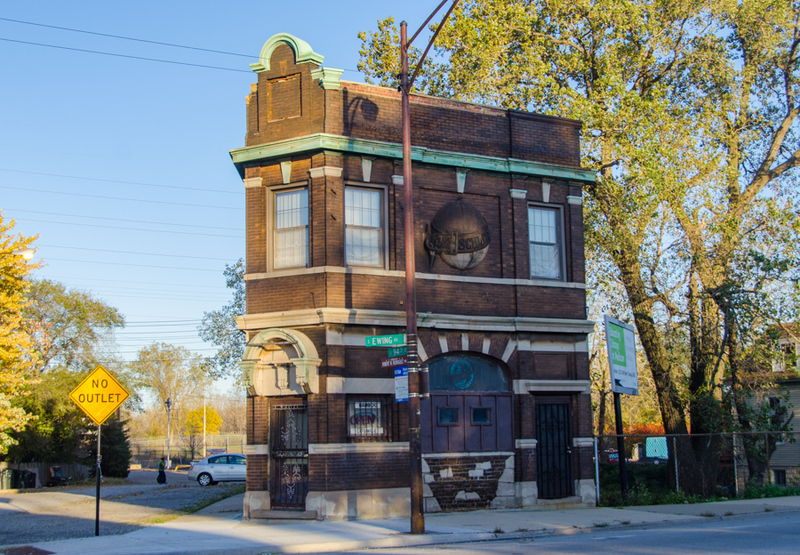 A distinctive time capsule of a neighborhood tied house tavern, the building clings – for now – to the ragged frontier between the industrial past and the uncertain future of Chicago’s far southeast side. But for how much longer? 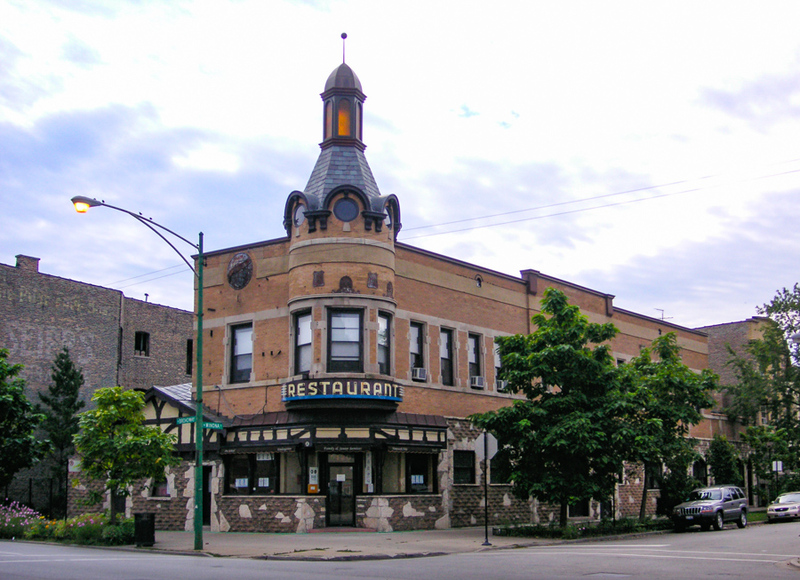 The corner tavern is a dying species in Chicago. Many of those remaining are on borrowed time, licenses set to expire with their current proprietors. A creeping block-by-block rebirth of Prohibition has overtaken much of the city, leaving a once-ubiquitous Chicago institution on the brink. Even more rare is the tied house: a bar built by a particular brewer to serve a particular brand of beer. The efforts of early Temperance advocates led to escalating licensing fees, which advantaged well-financed brewers over small tavern keepers. Tied houses were an ingenious achievement in vertical integration, and boomed along with the brewing and beer-shipping industry of Chicago. Tied houses used distinctive and high-quality architecture to carve out brand identity and convey an air of respectability. Their substantial buildings were nearly always sited on valuable real estate at prominent corners, where the side doors that could be kept open overnight and on Sundays just so happened to face a street too. Many were built in Chicago around the start of the 20th century, but their heyday was short. Prohibition took a harsh toll, and vertical integration in the alcohol business was made illegal when it was repealed. Some tied houses have survived as ordinary bars in extraordinary buildings. Others were repurposed. 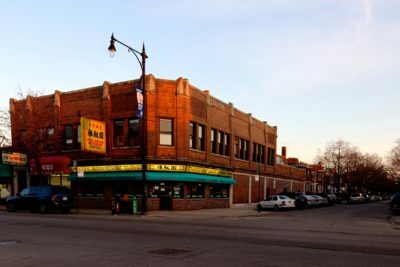 In 2011, the City of Chicago officially recognized their significance as a category, granting several of them Chicago Landmark status – and the protections and tax benefits it confers. At that time, at least 41 tied houses were known to remain in Chicago, but only five were selected for landmarking – all built by Schlitz. Schlitz was the third biggest brewer in America in that era, and while it was based in Milwaukee, it had substantial distribution and business operations in Chicago. Company Vice President Edward G. Uihlein oversaw the most ambitious program of tied house construction in the city, putting up 57 over the course of about a decade. They were widely distributed outside of downtown in neighborhoods with immigrant industrial workers. 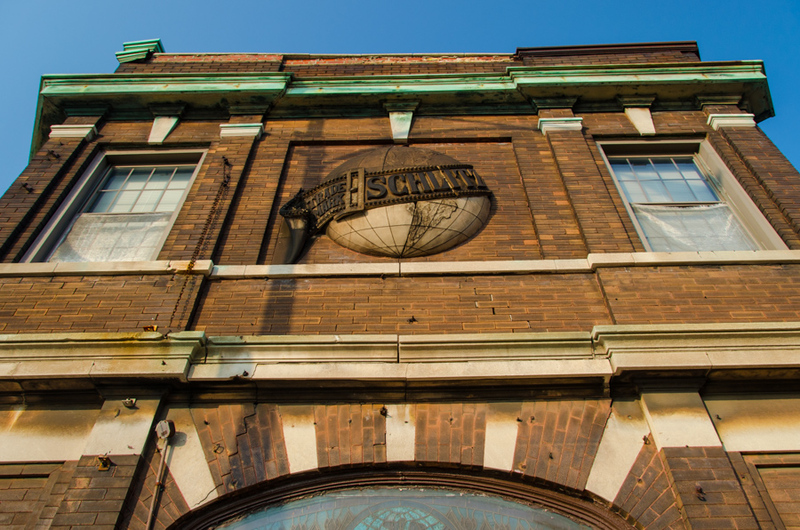 Schlitz tied houses were instantly recognizable thanks to the prominent use the “belted globe” insignia. The typical tied house featured a bar on the ground floor and apartments above. A narrow but elaborate facade fronted on the principal commercial street, with a much plainer facade on the side. The main entrance to the bar was often set dramatically into a chamfered corner, with a secondary entrance on the side street. 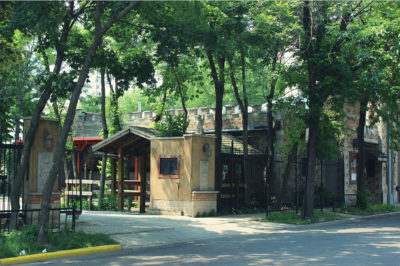 The overall style of the buildings was some picturesque adaptation of the Queen Anne idiom popular at the time, with elaborate brickwork and accents in limestone and pressed metal. With more significant budgets than would have been available to independent proprietors, tied houses were often designed by relatively well-known architects. Charles Thisslew designed several for Schlitz. Most of his other extant buildings are greystones in Wicker Park and Logan Square, elegant residences for the immigrant elite at the turn of the last century. 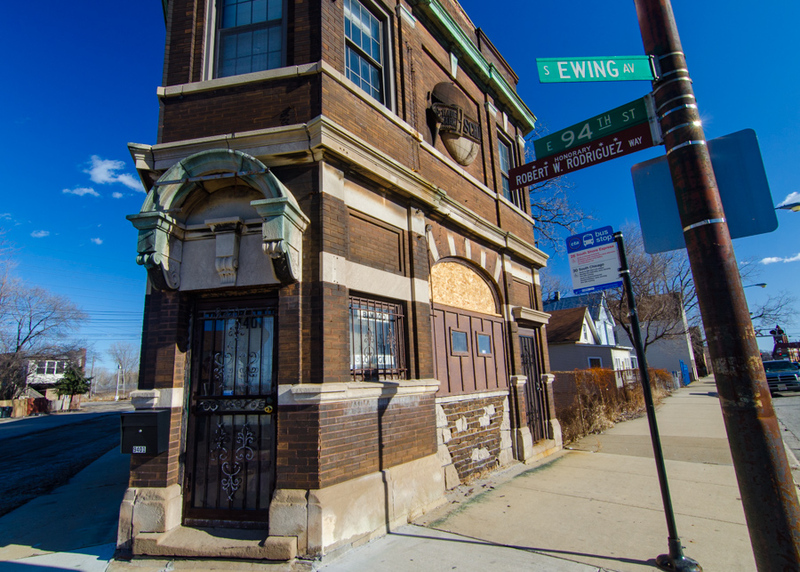 Charles Thisslew designed the building at 9401 S. Ewing, which records date to 1907. At the time it would have been one of many taverns serving thousands of workers in one of Chicago’s largest industrial complexes. Employees of Youngstown Sheet & Tube, Great Lakes Dock & Dredge, US Steel’s massive South Works, and countless other concerns might have stopped by for a pint after a shift. Countless belching smokestacks left a patina of soot on the building’s tan bricks – but couldn’t dim its simple elegance. Its odd shape makes the most of an acutely-angled site. The limestone string course and arch above the corner door are echoed neatly in the pressed metal capping the parapet. 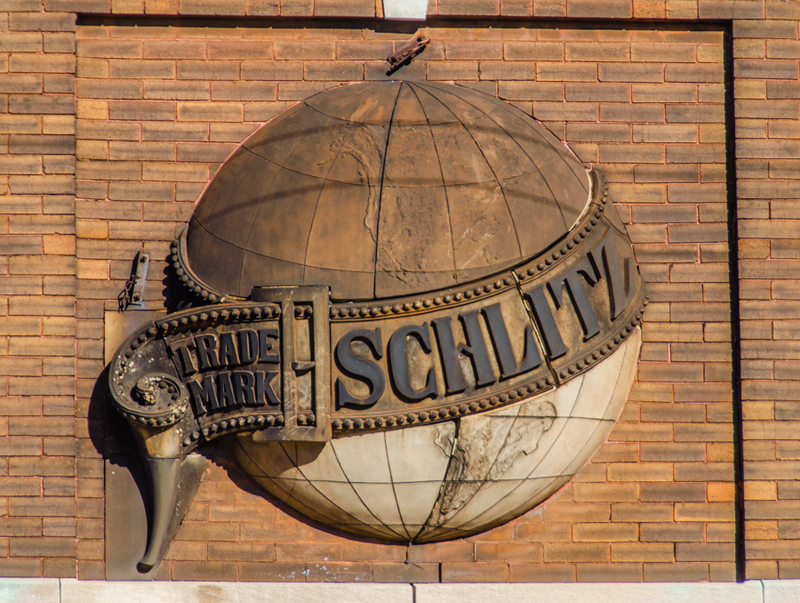 The heavy terra cotta belted globe and a ghost sign facing south proclaim the Schlitz brand. And so did the stained glass window under the arch facing Ewing – until it was removed, sometime in January 2017. The interior is a time capsule, hardly changed over the decades. At some point a vague tiki theme was instituted, but little changed beyond the decor over the bar. Unlike many other tied houses, the upper floor consists of small sleeping rooms – not larger apartments. These would have been ideal for transient laborers, and one can even imagine sailors stopping over while ore ships unloaded at the mills. After years of very marginal operation, the Bamboo Lounge was advertised for sale in December 2016 for the princely sum of $65,000. It failed to garner even that amount when it sold in January 2017 for a mere $35,000. The listing emphasized the building’s historic charm, dwelling particularly on the stained glass window – which the buyer quickly removed. It remains to be seen what the buyer intends, but there is reason to be concerned. Perhaps the window was removed for safekeeping – but perhaps it has been sold, or now graces some suburban man-cave. It’s hard to imagine what a new owner might intend for the space – in such an odd location, there’s precious little demand for apartments or a commercial storefront. 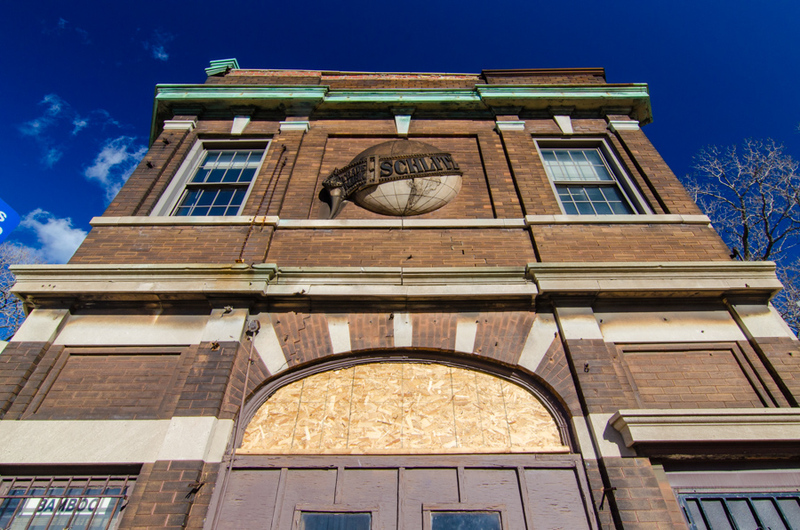 The building was not among the tied houses chosen for Chicago Landmark designation, so there is a risk of unsympathetic modifications, or even outright demolition. A different outcome is possible. 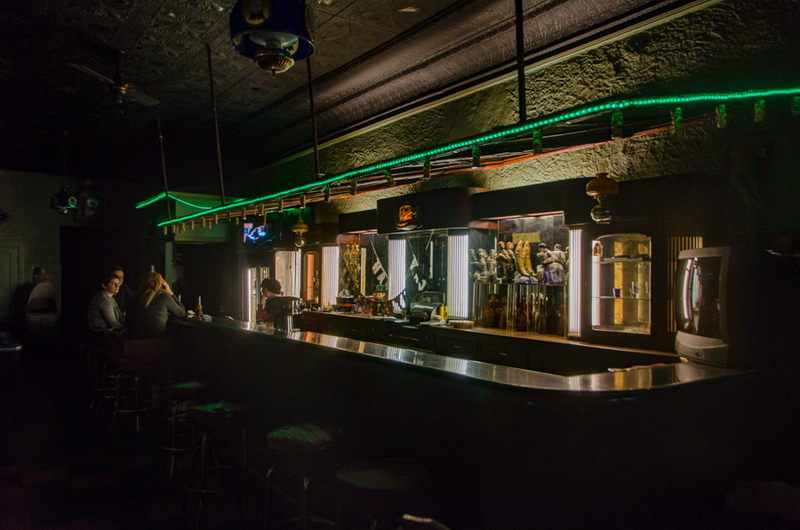 The vintage charm and compelling – if remote – location could help make the Bamboo Lounge a destination bar, a “must-visit” for architecture buffs, fans of the old-fashioned Chicago tavern, and folks exploring the city’s vast southeast side. It should be landmarked and restored. Let’s raise a glass in hope of that possibility! If you know anything about the history or current status of the bar, please leave a comment. 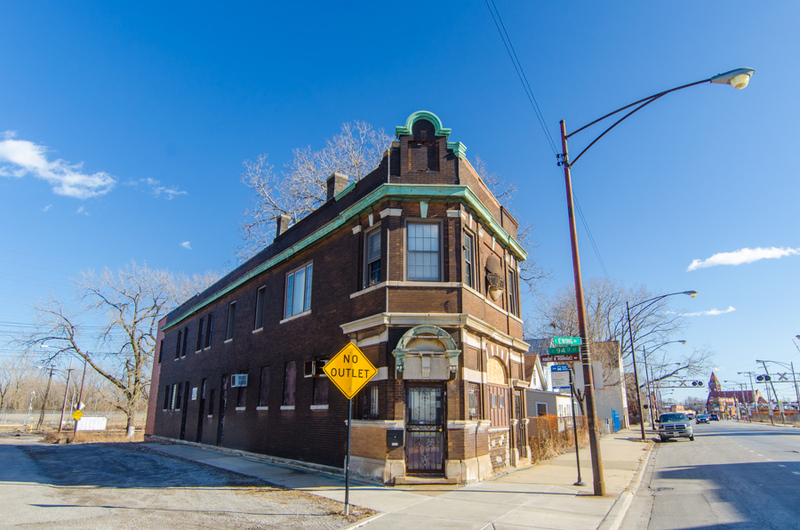 If you think this building deserves to be preserved, consider contacting your Chicago Alderman, particularly if you live in the 10th Ward. The recording of the sale hasn’t been posted on the Cook County Recorder of Deeds website yet. For anyone interested the PIN is 26-05-305-001-0000. In 2015, there was a quit claim deed wherein the owner transferred the property to a relative. Thanks Steven! Hopefully we learn more if and when the paperwork surfaces. 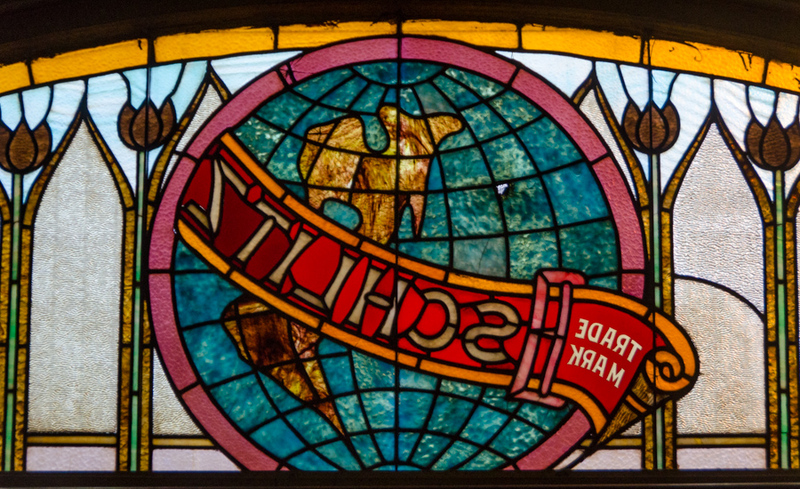 The belted globe logo has its beginnings in the 1893 Columbian Exposition; Schlitz had a massive exhibition in the Manufacturers Building by Richard Bock which the globe, belt and figures blowing trumpets. Later that year, Schlitz employee Ernest Beifield (later co-founder of White City Amusement Park and the Sherman Hotel, and whose son, Ernie, anglicized his last name to Byfield and became a premier Chicago nightlife impresario running the Ambassador Hotels, Pump Room, Sherman Hotel & College Inn and Drake Hotel), assisted in creating the company’s new slogan, ‘The Beer That Made Milwaukee Famous’. Do we know who fabricated the replica globes for the tied houses? I think they’re all either terra cotta or pressed metal. Sad to see this. I visit it every year or so to make sure it’s still there and to admire the window, which is missing on all the other Schlitz tied houses left in Chicago. I have a few photos from the Schlitz company records showing some of their property holdings in Chicago, and all the pictured buildings had stained glass logo windows, including the building at 19th and Blue Island, which doesn’t have any identifying Schlitz details today. Hopefully we can shine a light on what’s happening and keep it from getting any worse. Thanks for the comment, and watch this space for more! Many good memories there . knew most of the men that lived upstairs also. RESTORE THE BAMBOO FOR THE LOVE OF GOD! It truly is a Landmark! Thanks for sharing Allix. Thanks Lenny! Do you have any photos of the interior? I only had a couple. Yes Eric I believe I do It will take me some time to go through them but I will contact you when I find them. You should post these photos if you can! Sure, I can submit those photos to the Chicago Patterns flickr group. It will probably be a few days before I get to it. Comment here when you do! If it’s OK, we might even add one or two to this article, or at least link to the Flickr photos! Awesome old pictures! These are great. Thanks! The Bammboo Lounge was my hangout for many years since the early 1980’s. I have pictures of parties there. I also believe the people in the picture in this article is me. Contact me at any time. 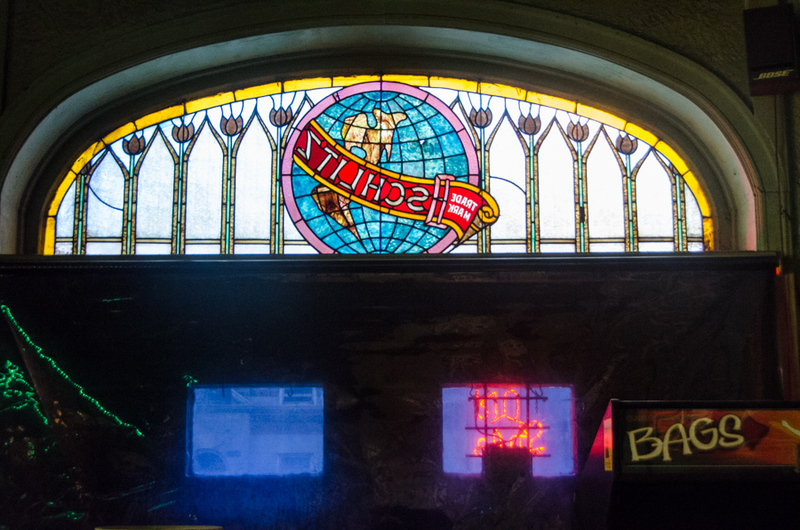 The Schlitz stained glass was removed? That’s sad to hear. Hopefully it’s just being kept somewhere for safekeeping, and that this building is preserved in some form. When did this bar close down, anyway? It seemed it like it closed not long ago, but not sure when that did occur. I guess that quietly occurred, without me realizing it. Correct me if I’m wrong, though. It is unclear what has become of the stained glass window, or what will happen with the building. I hope for the best, but there’s reason to be concerned. The building has no formal protection, and could even be demolished if the new owner so chose. My co-worker’s family sold the building. He told me the buyer is a man from Wisconsin who just wanted the stained glass sign. So it’s probably in his man cave right now. :( Who knows what his intentions are with the building. I live in the 105th ward and I would buy it back for less! That’s a bummer! I have a friend and neighbor who is interested in the building as well. Would it be OK for me to pass your comment and email address along to him? 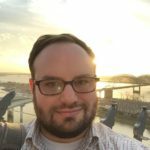 He might have some questions that you might be able to help address. Awesome, will pass along your email. Thanks! Thanks for sharing these memories Eric! Sounds like it was a lively place. The last owner of this bar was a woman named Frannie. Not sure 100% of her last name. I met her through a mutual friend who I drink with at another neighborhood bar. She was a nice woman, who wanted to keep the place going out of nostalgia — more than anything else. I also heard that back in the 1940’s, this bar was owned by the Popovich Brothers. They were a Serbian family who played tamburitza music for years together as a band. My one friend, of Polish decent who wife was Croatian, used to come her when he was a teenager in the 1940’s to hear the Popovich brothers (also known as Popeye’s) play. He also learned how to make barbecue lamb on a “spit” from the guys who used to hang out here at the old bar. I don’t know how long the Popovich Brothers owned the bar. But I heard that there was (still is?) a ballroom in the back of the bar where they used to have live band music and dancing. Again, this was back in the 1940’s and ’50’s.